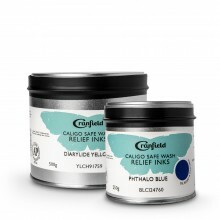 A linseed oil based, lightfast relief ink for printing all types of relief plate including wood, lino and vinyl. Cranfield Traditional Relief Ink is formulated from a careful mix of traditional linseed oils and vibrant lightfast pigments. As well as being highly pigmented, the formulation provides a viscosity and structure to the ink, along with the unique linseed smell. This keeps the relief print as fresh and bright as the day it was created. All the inks are rated 6 or higher on the International Blue Wool Scale. The range benefits from lovely metalic silver and gold as well as a transparent base. They can be used on all types of relief plate and can be cleaned up with vegetable oil before a final wipe with a low odour or plant based solvent. The range benefits from lovely metalic silver and gold, as well as a transparent base. They can be used on all types of relief plate and can be cleaned up with vegetable oil before a final wipe with a low odour or plant based solvent.